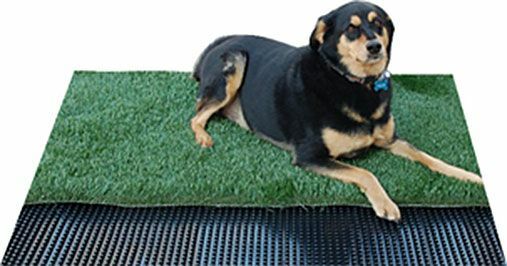 Efficient drainage of dog urine, etc. is critical to maintaining a clean, odor free and longer lasting turf. Saturated turf pads without the ability to wash out and evacuate is problematic to both the lifespan of the turf and odor and cleanliness of the area. P•DRAIN creates air void so urine can be washed down through turf to avoid it being held by the turf and cause odor. It also creates a channel to convey the urine and wash down water directly to drains. P•DRAIN consists of a polymeric sheet cuspated under heat and pressure to form a high flow, high compressive strength dimpled drainage core. The core is available as an impermeable sheet or punched, based on application. Impermeable core works well on slabs/indoor surfaces as it protects urine from being absorbed by the concrete. Punched core allows liquids to flow through to ground surfaces below.